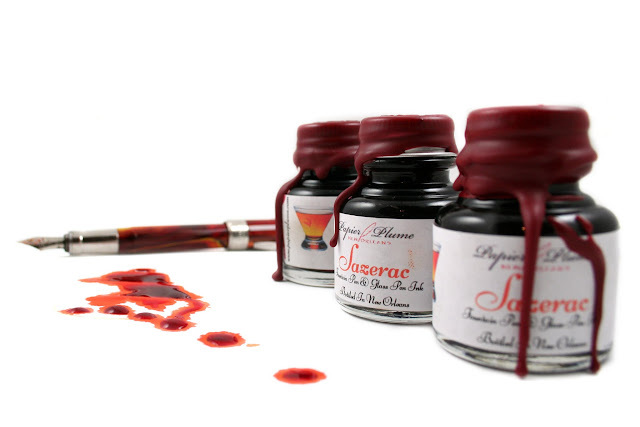 Papier Plume Sazerac (Very Limited Edition) | Inkdependence! This picture is from Papier Plume. Neat, right? This ink is going to be available starting (and probably ending) tomorrow (7/15/2016) at Papier Plume. If you're local, then go get in line right now. There are only 55 bottles, so it'll go fast. I got my review sample a bit early from Renso at Papier Plume, so I've been using it for about a week. Sazerac is a really cool orange that isn't heavily saturated, so you're going to see plenty of shading from this ink. 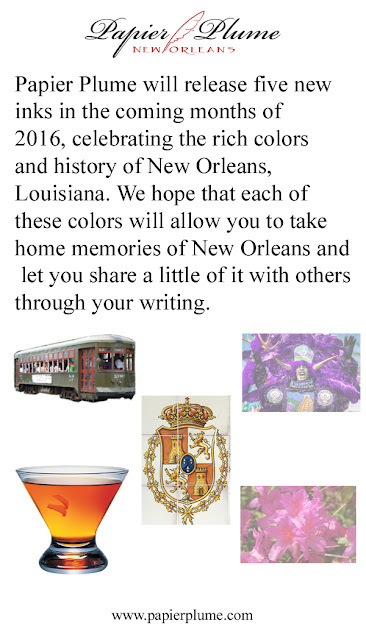 It reminds me most of orange creamsicles, but if you're familiar with New Orleans then you might recognize the name from the drink or the company whose brandy was originally used to make it. It's the official cocktail of New Orleans (and it used to contain absinthe), so things are bound to get a little weird (awesome?) at that party. Check out this interesting orange shader below and let me know if you've had a Sazerac in the comments! The above was written with a Conklin 1.1 stub. I hear people bash the new Conklin pens, but I have always loved this stub. Don't believe the dis-hype. I took pictures of this ink wet (above) and dry (below). Cool, right? This is the part of my desk where I was filming the slow-mo video of the ink swatch drying. This one was taking forever, so I snapped a couple of pictures that came out looking nice. I happen to have three pens with orange inks in them. That's totally normal. Totally. Here's a closer look at the three oranges. This is pretty heavy paper, but if you lay down enough of this ink it'll bleed through. Notice that the written bit didn't bleed at all. Just the part where I dripped it on the paper and spread it out. Not the best behavior, perhaps, but certainly not bad. There's some bleed expected when you use a wet stub nib on copy paper. The lower sample doesn't show anything much bleeding through, so that's good. This link won't work until the ink is live on the Papier Plume site, but if you're in love with this creamsicle-y ink then you might want to have it preloaded in a browser. Here are some images with info on the ink and the collection that Papier Plume sent me. 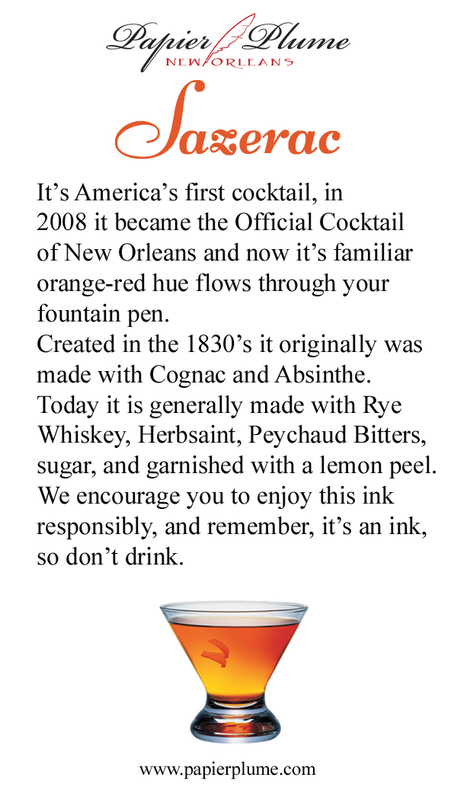 Sazerac, at least in the better bars in New Orleans, is actually usually made with absinthe again. It was re-legalized about 10 years ago. You're only supposed to coat the inside of the glass with it, then dump any excess. I prefer mine with a twist of lemon peel. I love orange inks, so I bought this as soon as the email went out this morning. I'm semi-local (southwest Louisiana), so I should get it on Monday. That sounds awesome, Pinstripebindi. I'll have to try one of those when I get a chance. I've never had absinthe (it wasn't legal when I was into cocktails, I guess). What's it like? Absinthe? You mostly taste anise, which is very similar to licorice. If you've ever had ouzo or anisette, they're in the ballpark. Although different brands have different herbal mixtures and there's some variety. It's quite bitter and strong straight, which is why it's almost always diluted with cold water and sugar added. It doesn't actually make you hallucinate or anything like that; that's old anti-absinthe propaganda from wine-making countries that were pissed absinthe was usurping wine's popularity. It's just booze.